In February/March 2012, I visited India for the first time, travelling along the Yamuna River, one of the seven Indian rivers, to document and understand the relationship that Indian people have with the river. As I started to gather information about the Yamuna, I realised that the river and its culture was under threat from pollution and it was an inevitable subject matter. My journey lead me first to Sangam at Allahabad for the end of the Magh Mellah festival before visiting the villages of Hamirpur and Beekar where environmental organisations run ecological projects to educate people and make the river and its environment sustainable. However, it is in Mathura and Vrindavan in the Braj region, the birth place of Krishna that I realised the size of the ecological disaster in the Yamuna river. Like in Agra and Delhi, there is thick, dark water so that it is difficult to describe it as a ‘blue river’. Known as a blue Yamuna and river of love, nowadays, some Indian people does not hesitate to describe it as a dead river. Hope can only come from the Indian government to support financially a massive environmental program and make ecological laws to protect its environment. 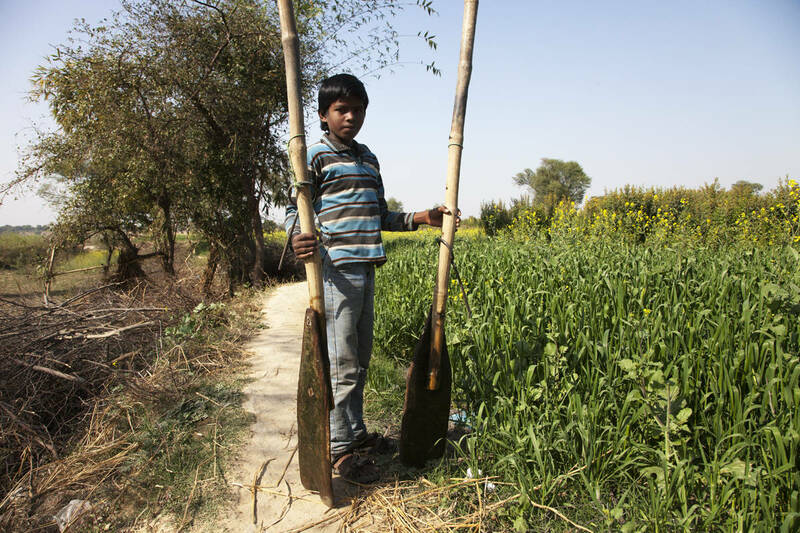 And despite the work of ecological organisations relying on private funds, it is simply impossible for them to save the Yamuna river. Along the river, I talked to many Indian people. Most of them are aware of the pollution and its consequences. I often admired the faith of pilgrims bathing in the river and sometimes sipping its water. Our mother Yamuna is pure, one of them told me.